As part of this continuing series on the Lake O’Hara area I would like to share one of the coolest wildlife encounters I have ever had. An unexpected encounter with not one, but two wolverines! First of all upon arriving at Lake O’Hara you can check in at Le Relais shelter which sells the best carrot cake on the planet (they only accept cash so make sure to pack some in with you) and while you are there you can browse through any recorded wildlife sightings that fellow hikers have noted on the trails. This shelter is right where the bus drops you off if you are day hiking, or if staying at Lake O’Hara Lodge, or the ACC Elizabeth Parker Hut. If you get dropped off at the campground it is a short 10 minute hike to the shelter which is right next to Lake O’Hara. Full disclosure; this post is not about providing an exact location where I saw and photographed wolverines, but if you look through this wildlife sighting record in Le Relais you may see roughly where and when others have made their observations for all types of wildlife (bigger than a squirrel) – grizzly bears are another amazing animal that visits the Lake O’Hara area very regularly. Keep your eyes open while you are out on the trail and you will see all sorts of activity! Please respect all wildlife and observe anything you come across from a safe distance. When I had this encounter I thought this was going to be so rare and everybody would be surprised (and the fact I had the chance to photograph two is!) but when I got back to check the book in Le Relais I found it was reasonably common for wolverines to at least be seen in the Lake O’Hara area from time to time. The wolverine – what is it?! Wolverines are the largest species in the weasel family. Males weigh about 15kg and females, 10kg. Despite their smaller size they have been seen taking down animals many times their size, like Caribou! Their scientific name is Gulo gulo, meaning “glutton”, because they have a reputation for eating large amounts of food in one sitting and they protect their food ferociously even if it is a grizzly bear trying to take it over. This animal is thickly furred, mostly dark brown, with a light band across the forehead and a broad light stripe along each side, extending into the tail. Bottom line – if you see something that could almost be a bear (large/dark) if it wasn’t for the small head then it could be a wolverine. Wolverines have very large, wide, teeth for shearing meat, and long curved claws for tearing and digging. Their feet are massive in relation to the rest of their body allowing them to cover huge distances. 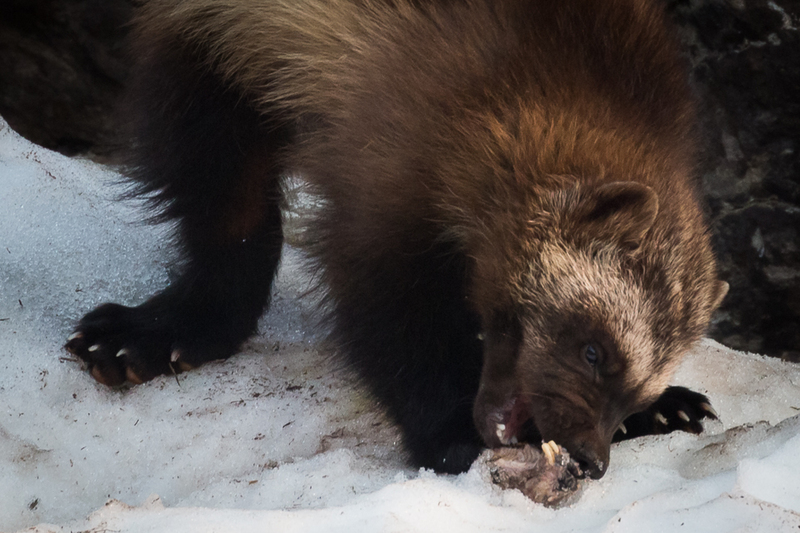 Wolverines eat whatever animals they can find, including rodents, snowshoe hares, and birds. 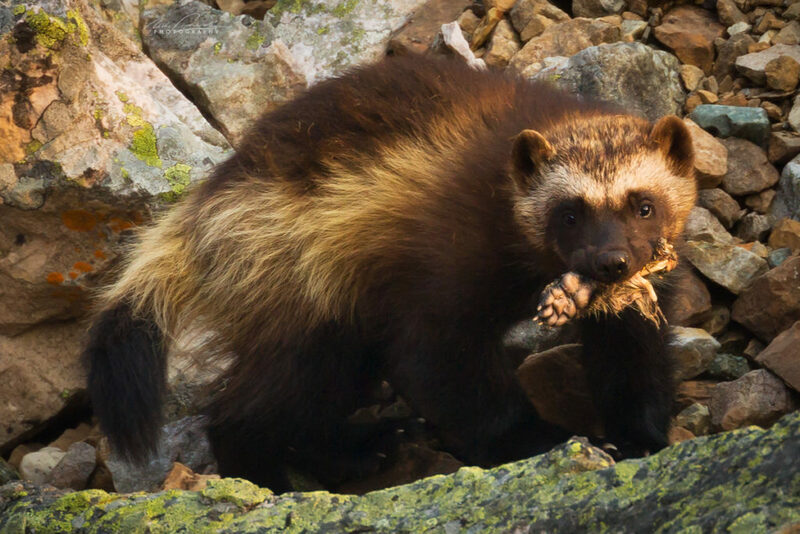 Other animals like elk or mountain goats that die and get buried in avalanches over the winter are also important food sources that don’t have to be worked as hard for, and the wolverine can smell these out even though they are beneath the snow (or find it when the snow melts). Researchers estimate that there is just one wolverine for every 150 to 300 km2. They cover a lot of ground in search of food and mates. In the far north, males may range over 3000 km2, an area as large as Kootenay and Yoho National Parks combined. Here in the mountains, home ranges are smaller, typically 600 to 1000 km2 for males, but no less impressive when you consider the rugged terrain they must cross. Females, especially those with young, maintain a much smaller home range, 100 to 500 km2. 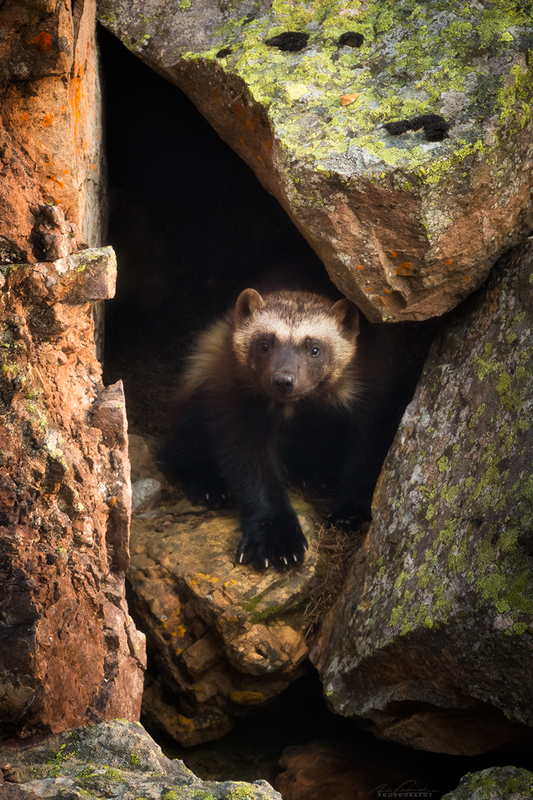 Human settlement and increased use of remote backcountry have shrunk the wolverines’ range to the northwest part of the North American continent. 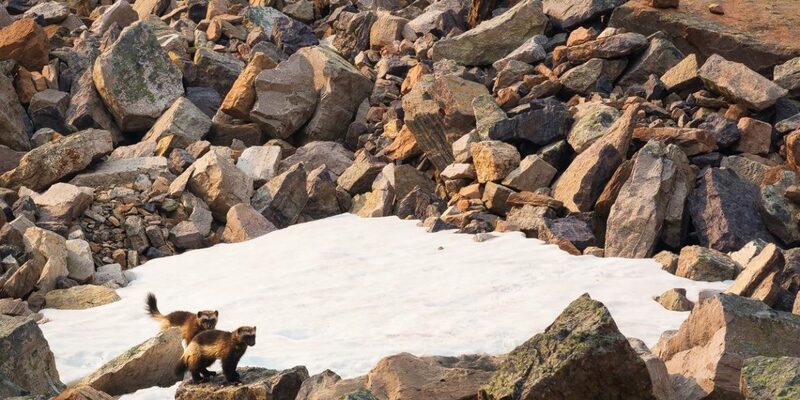 Wolverines in Western Canada, including the Mountain Parks, are listed as a Species of Special Concern by the national Committee on the Status of Endangered Wildlife in Canada (COSEWIC). This ranking reflects their low numbers and slow capacity to recover from population declines. 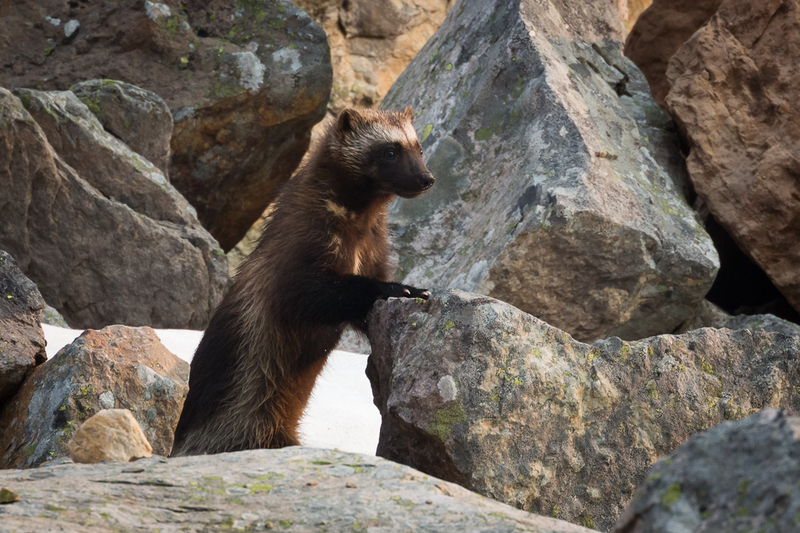 Canada’s Mountain National Parks play an important role in providing valuable habitat for the wolverine near the southern limits of its range. 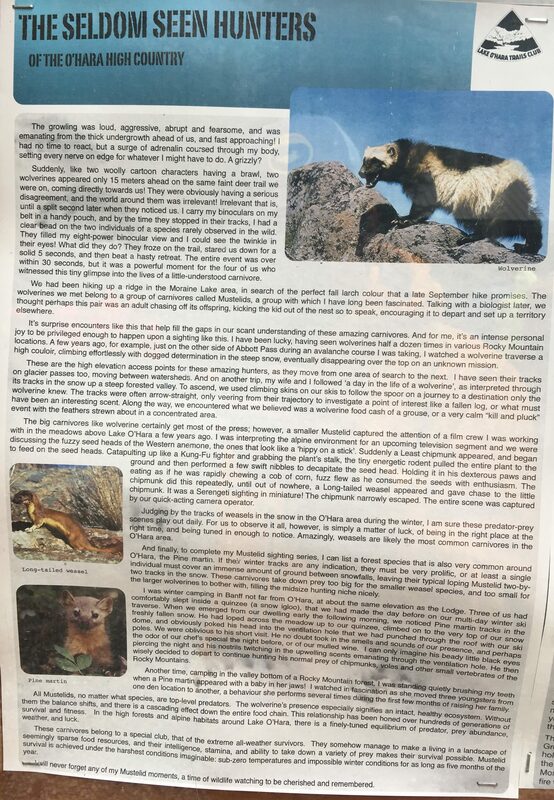 Click the image for more detailed information on Wolverines. I had been exploring a remote corner of The Lake O’Hara area, it was the first week of August in 2017, and smoke from wildfires in Kootenay National Park filled the sky. My friend Pierre-Luc had accompanied me on this adventure and we were returning from an exploration, traversing through a boulder field. We came over a short rise and I immediately saw two animals chasing each other and rolling around on a snow patch ahead of us, unaware of our presence. I knew right away this was something rare that I hadn’t seen before in full view (I had caught a glimpse of a wolverine near Peyto Lake on the Icefields Parkway in 2009). It sent a shiver up my spine and I stopped dead in my tracks. Pierre Luc knew something was up as he joined me at our vantage point above them and maybe 50-100m away from them. It only took them a few moments to become aware of our presence and that initial playfulness I saw in them changed immediately to what looked like scavenger mode as if a switch had been hit. They both actively moved through the boulders and remaining snow patches, sniffing, digging and every so often chasing the tail of the other for a moment. They maintained their position relative to us, not running away. It did appear that they were trying to find something though, and quickly. Maybe they thought we were going to steal whatever it was. I happened to have the Canon 100-400mm lens on me AND a 1.4x teleconverter. I hardly ever carry the teleconverter with me for some reason. What luck! 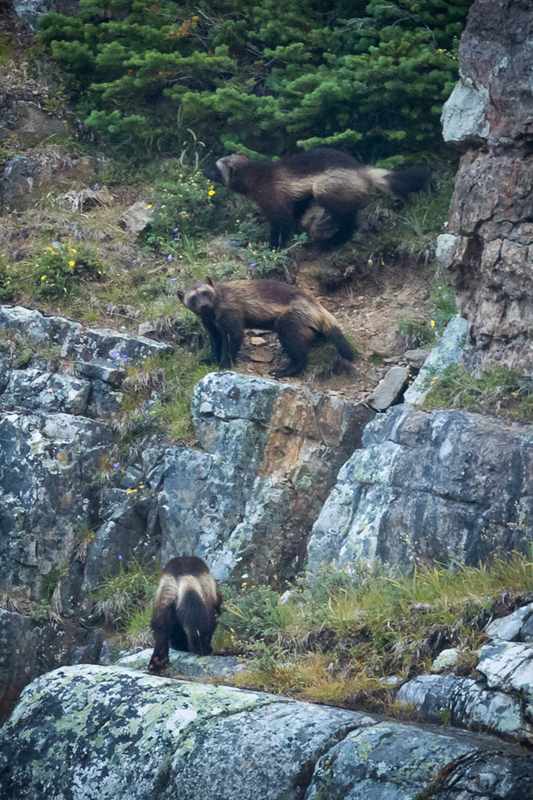 It gave me 560mm on the full frame camera and that turned out to be a great combination to photograph these wolverines from our distance. Initially I thought the wolverines would run off so I hesitated to even bother taking any photos at all and instead to just enjoy this rare experience! Pierre Luc told me to get on the lens change ASAP though when he realized I really meant it when I said I wasn’t going to photograph them, so I got to it, taking the role of wildlife photographer on for one of only a few times in my life. I bought the teleconverter so I could photograph the mountain peaks more closely, not for this! I grabbed a lot of photos from our spot of their activities but it was often hard to see both of them together as they just never stopped moving. Relentless. Also the boulders made it hard to even see them being similarly colored as they ducked and weaved through them. Eventually the wolverines began to move off and we picked up our day packs and followed from a distance as they were headed in the same direction as us. Keeping them just barely in sight as we continued, sometimes rounding corners just as they went out of sight again. This didn’t go on for too long before they disappeared completely from view. We kept moving giving the spot of their last sighting a wide berth, looking at their bigger than expected footprints in the snow in one spot as we went. We eventually stopped at another high vantage point further on and sat well hidden keeping an eye on the spot where they had disappeared. It must have been 30-40 minutes later, and they emerged from a hiding place and started to go about their business again, mostly digging in the snow patches and this time uncovering animal parts! When I zoomed in on image review there was a jaw and also a hoary marmot foot which gruesomely dangled from ones mouth at one point! (See the photo above). They both looked younger in appearance than the more grizzled look of the ones I had seen photos. Eventually we left the area once the wolverines headed off over more tiring bouldery terrain in the other direction making their chosen path of travel look effortless. In total we had been in the presence of these wolverines in the wild for about 2 hours, maybe longer! I was definitely buzzing from the chance encounter. What could possibly top spending time photographing 2 wolverines? Well the answer came the very next morning! We had gotten up and hiked through the dark to reach a picturesque spot for sunrise. Sunrise turned out quite well thanks to the smoke subsiding briefly and as I searched for more compositions as the light came up, Pierre Luc carried on ahead to the next location. 5 minutes after he had left, 3 wolverines came into view in a line moving fast on the far bank of the lake. No stopping. I saw that I would miss getting a shot completely if I didn’t act quickly. Shaking in anticipation I changed lenses. I quickly programmed settings that would give me the best chance of getting a clean shot of them in the low light. It was too dark for the teleconverter and I was already pushing it at iso1600. Now I know why wildlife photographers spend a lot of money on those big heavy lenses that have a faster aperture value than the lens I was using right here which maxes out at f5.6 when zoomed in to 400mm, and f8 when using the 1.4x teleconverter. It’s still a great lens but for this light and speed of animal movement it came up a bit short. I fired off as many shots as I could catching a few but they quickly and effortlessly crossed the outflow of the lake and wiped out a huge amount of elevation gain through cliffs before it was all over 2 minutes later. This is what I expected the sighting the day before to be like, over in a flash, like most animal sightings I have. I am not too sure if this 3 included the 2 I had photographed the day before either. Zooming in it looks possible but not a sure thing as they are not as clear in the photographs (Have a look for yourself at the image below). Pierre Luc was understandably kicking himself when I told him about the improbable second encounter when I finally caught up with him! I feel very lucky to have been able to photograph these amazing creatures and quickly went out to learn more about them. I purchased the book, ‘The Wolverine Way’ which I can highly recommend. It documents a wolverine study in nearby Montana which went on over a number of years and uncovered a lot of new information on them. If you are interested in visiting the Lake O’Hara area on a day trip this summer then please get in touch using the form below. As a commercial guide I have the ability to book the bus in on short notice – come and experience the area with me as your guide! You could also sign up to my mailing list below to hear about any 2020 trips to the Lake O’Hara area that I have first. These will be released in December. In the following parts to this blog series on Lake O’Hara I will explore Wildflowers (part 3), and the Alpine Larch Trees (part 4). Part 1 of this blog series on Lake O’Hara can be found by clicking here. It details the logistics of getting to Lake O’Hara as well as some basic tips and advice on hiking and photography in the area.